Etchers and engravers use cutting-edge technology to perform a century-old craft. They operate specialized tools and machinery to create decorative engravings on items such as awards and trophies, gifts and signs, or identification plates and circuit boards. Etchers and engravers use both hand tools and power tools to inscribe lettering and designs on surfaces— usually metal, glass, or plastic. Skilled with computer aided design and manufacturing software, they also create digital versions of designs to program their equipment to create a perfect execution of each piece. An exacting eye is essential in this field; you must have a steady hand, patience and good eyesight to draw layout lines and designs using a compass, scribe, or pencil. The work can be wearing when deadlines require many hours of intense focus at a stretch. Most etchers and engravers work in retail and manufacturing settings. Usually, employers prefer to hire candidates with a high school diploma or the equivalent, then teach them skills on the job. 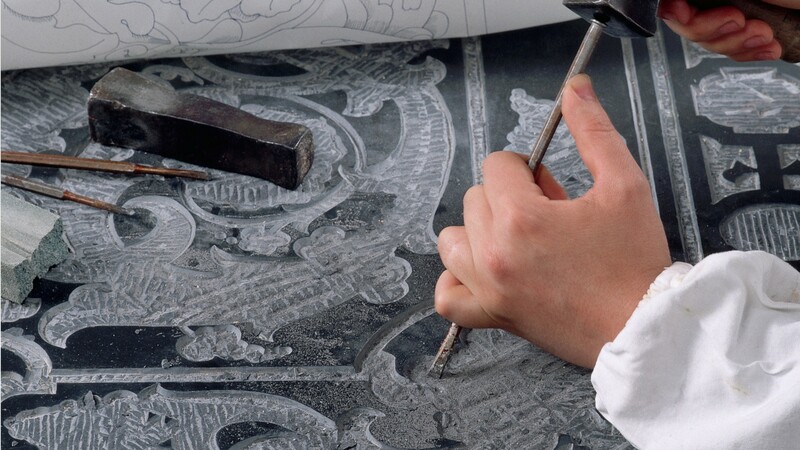 Whether engraving a simple metal plate, or etching intricate details on a fine crystal glass, etchers and engravers create the heirlooms of the future. Inspect etched work for depth of etching, uniformity, and defects, using calibrated microscopes, gauges, fingers, or magnifying lenses. Examine sketches, diagrams, samples, blueprints, or photographs to decide how designs are to be etched, cut, or engraved onto workpieces. Clean and polish engraved areas. See more details at O*NET OnLine about etchers and engravers. Etchers & Engravers by U.S. Department of Labor, Employment and Training Administration is licensed under a Creative Commons Attribution 4.0 International License.